When I was about 14 years old, I begged my mother to let me make an apple pie. Permission was granted, but I was on my own...pies were not her thing. So, with the old family cookbook in hand, I proceeded to create that first pastry wonder. The canned apple filling tasted like it should, but the bottom crust was thick and doughy and the top crust was like cardboard. Afterward, my mother's comments led me to believe that she thought I would never become very good at pie baking. In spite of her lack of confidence in my future as a pie baker, I kept trying. As I practiced and practiced, I often felt that some sadist had coined the phrase, "Easy as pie." Pies were not easy...I did not have a problem with the different fillings, but the crust was another story. For years, my creations, while not terrible, were not the melt-in-your-mouth pastry I longed to create. It was not until I prepared to teach a pie class for our church women's group, that I put forth the effort to actually learn all I could about making pie crust. I watched television chefs and cooks who gave me a whole new perspective on the art of making pie crust. I studied cookbooks and talked to other bakers. All in all, I came away with a wonderful list of does and don'ts for my file. The following pie crust recipe was given to my children's 4-H club by the leader, a home economics' teacher. The recipe makes a wonderful, flaky crust, but don't make it until you have read the secrets that follow below. 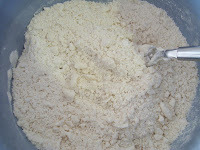 Measure flour into a bowl, add salt and mix with a fork. Add shortening and cut it in with a fork until the ingredients are broken down into the size of small peas. Add 5-6 T ice water. Mix with a fork until the dough just forms. No over mixing. Gather gently into a ball. Cover dough and refrigerate while preparing filling. 1. When adding the ice water, add it one T at a time. Put the first T along the inside edge of the bowl and just mix enough flour with a fork to combine with the cold water; mix gently and stop when the flour will not stick to the little clump easily. The second T of water will be mixed in a second spot with the same procedure…and so on…all the clumps will be separate until the final gentle combining…this lessens the ‘working’ of the dough. The more a pie dough is worked, the tougher it will become. 2. Buy a pastry cloth on which to roll the pie dough. It will lessen the amount of flour that is re-worked back into the dough…which makes for a more tender dough. After using, I shake out my pastry cloth and scrape any stuck on dough. Then, I put the cloth in a plastic zip-lock bag in the freezer. I only wash the cloth by hand as needed, with a little unscented detergent and hot water...rinse until water runs clear and hang cloth to dry. (If you do not keep the floured cloth in the refrigerator or freezer, it will attract little bugs). 3. 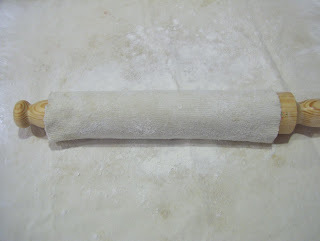 Use a pastry cloth sleeve for the rolling pin. Same reasons as using the pastry cloth. I shake off loose flour and scrape any dough bits off of the sleeve before storing it with the pastry cloth in the freezer. Wash as needed with the procedure mentioned above. 4. Form each dough piece into a ball and flatten it before rolling out, handling as little as possible. You may refrigerate one dough piece while working with the other one. 5. Roll the dough from the center out in all directions to form a beautiful, thin layer. Some people have asked me how thin this should be...I can only tell by how it feels...experience is the guide. 6. Place rolling pin on dough edge nearest your and lift the pastry cloth edge to make the dough roll up and around the pin. Lift the pin with the dough wrapped around it and place over the far edge of the pie plate and allow the pin to unroll back toward you so the dough to drapes over plate evenly. 7. Let the dough ease down into plate; do not stretch the dough. Dough has a memory and it will try to go back to its original shape...pulling might tear the dough. It is better to let the dough ease itself into the pie plate. 8. Trim edges so they are hanging evenly over the plate sides. Attach trimmed pieces, dampened with water, where necessary to make edges more uniform. If there are any tears in the bottom crust, push the dough together gently with your fingers. Your may also fill in a tear with a piece of trimmed dough. 9. Fill pie as directed by your recipe. If making a 2-crust pie, roll second crust as the first, lift up as before and unroll across the top of the filled pie. Trim edges if necessary and pull the bottom crust edge up over the top edge and crimp with whatever style you want. The reason to bring the bottom crust up and over the top crust edge, is to lessen the chance of the filling bubbling out during baking.There are many cook books with pretty crusts ideas...they might even inspire a veteran pie maker. 10. If you are making a one crust pie which is to hold a liquid-type filling...fill the crust half-way. Then, pull out the oven rack and place the pie plate on it. Continue with the filling process and gently push rack in and close the oven door. I don't know how many times I tried to walk an open-faced, filled pie over to the oven, only to have some of the filling slosh out as I was trying to get it into the oven...filling it half-way and finishing it on the rack, eliminates this problem. 11. To clean up bowls and utensils that have been used for making pie crust, use hot water. To clean up bowls and utensils that have been used for making bread dough, use cold water. 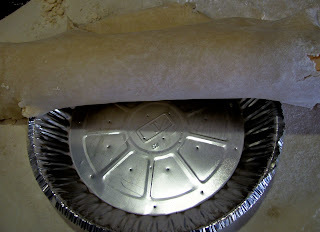 The hot water helps melt the shortening or fats in the pie dough residue. The cold water keeps the bread dough leavings from becoming a sticky paste. 12. A big secret: by incorporating the shortening with the flour, and keeping it cold and not working it too much, the fat particles are given more chances to burst apart as they bake. Each burst causes the dough to become light and flaky. 13. Buy a pie crust shield in the housewares department. After pie crust edge is optimally browned, the shield is placed on top of the edges. It will keep them from over-browning. 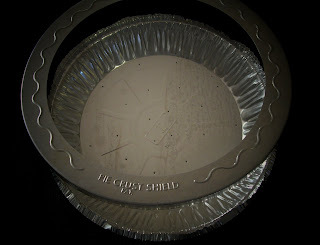 The shield is much easier to use and is more effective than using pieces of foil. 14. Moist pie fillings, like pumpkin, tend to make the bottom crust soggy by the time they are served. To help with this problem, a metal pie plate with a perforated bottom. If you cannot find one, poke random holes in an aluminum pie pan with a metal skewer or toothpick. Nothing is better than a great pie complimented with the perfect crust. I can vouch for the superiority of this recipe.